It never ceases to amaze us just how high tickets prices on Broadway have gotten! We’re not even talking about the Hamilton phenomenon, where, if you’re willing to wait until next January, you can get center orchestra tickets for $849 A PERSON! We decided to do some research about the average ticket price and we found one article where the writer says that she paid $2.50 (stand-up seats) in 1960 to see Gypsy at the Imperial Theatre. According to the Dollar Times, that would be the same as purchasing the ticket for $20.53 today. Today, Rear Mezzanine tickets to see Natasha, Pierre and the Great Comet also at the Imperial start at $59.00—three times as much! 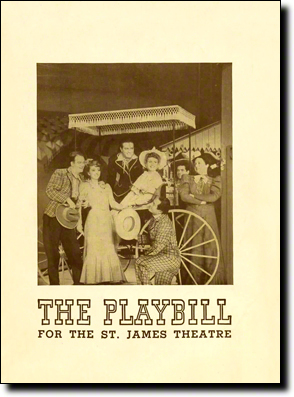 We then decided to look at our biggest hit, Oklahoma!, and found that the price in 1943 for the best seat was $4.80—that is $68.57 today. Anyone who has been to the theatre recently will know that it is hard to find mezzanine tickets for $68 dollars, let alone orchestra seats! Natasha, Pierre and the Great Comet (Imperial Theatre) is selling orchestra tickets starting at $169 per ticket, and center orchestra tickets for Miss Saigon at the Broadway Theatre are $249 per ticket. It is not unthinkable to know that tickets prices have increased over the years—but to increase 4, 5, or even 10 times, even accounting for inflation? CRAZY!